Have you ever watched, via a webcam set in some fixed position, the ebb and flow of life at one geographical spot on the planet? For several years, I enjoyed the view from the webcam located beside London’s Albert Bridge, looking across the River Thames and onto Chelsea’s Cheyne Walk. But that camera seems to have become defunct and I have switched my allegiance to the one that streams from Trafalgar Square. Because I am watching from the Southern Hemisphere, my view is often a night time one, but the hour of day makes little difference to the presence of traffic passing along the roads and footpaths. Red double-decker buses circle below Nelson’s gaze, taxis weave around buses, cyclists thread between both, and pedestrians mingle with them all. Even at 2:00 or 3:00 am, movement is continuous. Of course, London was not always like this. At the turn of the nineteenth century, and even with a population already in excess of one million, the streets did not teem with activity in the pre-dawn hours. For one thing, there was no gas lighting until the 1810s so it was hard for anyone to find their way around the maze of streets, lanes and alleys in the faintly lit city. But, despite the dark, one kind of traffic was not entirely absent—the foot traffic of the nightwalkers. Matthew Beaumont’s illuminating (pardon the pun) book Nightwalking: A Nocturnal History of London covers the period from the thirteenth to the nineteenth century, and shines a light (sorry, there I go again) on those who were abroad during the hours of darkness. Nightwalking, Beaumont reminds his readers, was once illegal in England. To be out and about after a certain hour meant that a person was breaking curfew and could be charged with the crime of being a ‘common nightwalker’. Those on the streets in the earlier centuries of Beaumont’s investigation tend to be morally, socially or spiritually suspicious: roisterers and rogues, vagabonds and vagrants, indigents and inebriates, and, predictably, the prostitutes. These are the people Beaumont calls ‘noctivagants’. But a second kind of nightwalker evolved in the eighteenth century—the ‘noctambulants’. 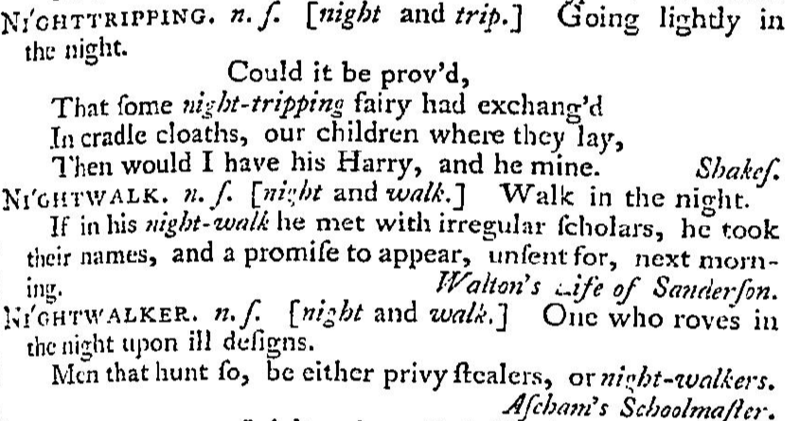 Noctambulants walked with some ‘pleasure-seeking or voyeuristic purpose’ or for ‘the sheer enjoyment of the act itself’ (Will Self’s definition, in the introduction to Beaumont’s book, p. x). Beaumont then adds a third nightwalking group (perhaps a sub-class of the second)—déclassé artists and writers who were exiled from polite society and who could afford no means of travel other than by foot (170). This group included the lexicographer and ‘militant pedestrian’ (210) Samuel Johnson; Romantic poets like William Blake and William Wordsworth; and the post-Romantic journalist and novelist Charles Dickens. For these writers, pedestrianism had ‘assumed the form of an intellectual, political, even spiritual vocation’, invoking the much earlier ‘spirit of vagrancy’ (229). Beaumont argues that nightwalking, ‘like writing poetry or taking opium’, was a way for some of these writers to foster a second self—‘a silent shadowy, mysterious other. It collapsed the dark recesses of the psyche into the labyrinthine spaces of the city’ (319). In the case of Dickens, his ‘craving for streets’ (‘Letter to John Forster’, 20 September 1846) was an intrinsic part of his being. He divided his foot-propelled journeying into two kinds: ‘one, straight on end to a definite goal at a round pace; one, objectless, loitering, and purely vagabond. (‘The Uncommercial Traveller’, All the Year Round 3.57 (26 May 1860): 156). A walk of the first kind took place in October 1857. Departing from Tavistock House in Bloomsbury at 2.00 am, Dickens proceeded directly to his Gad’s Hill Place home in Kent. Maintaining a brisk pace, he covered the 30 mile journey in a little over seven hours, arriving at his country home in time for breakfast. Presumably, he ate heartily. Dickens’s nocturnal walks were more usually of the ‘objectless, loitering, and purely vagabond’ kind. 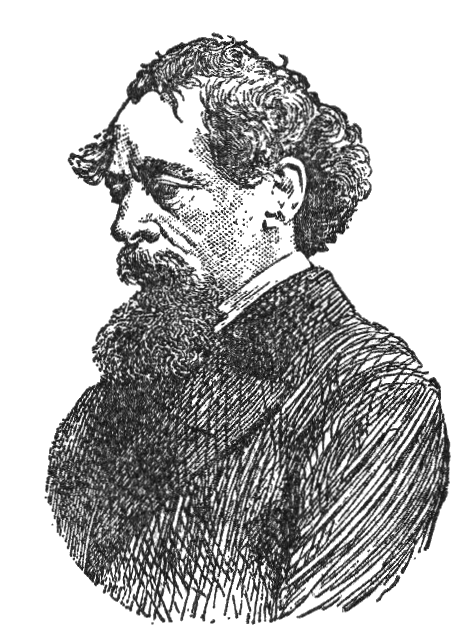 In another of his many ‘Uncommercial Traveller’ columns, written for his literary journal All the Year Round, Dickens describes a time in his life when he walked the streets from a little after midnight until just before sunrise. The first hours of his solitary walks were spent in company with ‘the restlessness of a great city, and the way in which it tumbles and tosses before it can get to sleep’. Eventually, the ‘flickering sparks’ of nightlife would die away, the city would ‘sink to rest’ and ‘the very shadow of the immensity of London seemed to lie oppressively on the river’ (3: 65 (21 July 1860): 349). Matthew Beaumont, like Dickens and others before him, has long been a nightwalker. He reflects that walking in a night time London, ‘no longer fighting against the traffic of cars and commuters’, is a discomforting experience and one that ‘involves displacements… The nighttime city is another city’ (3). 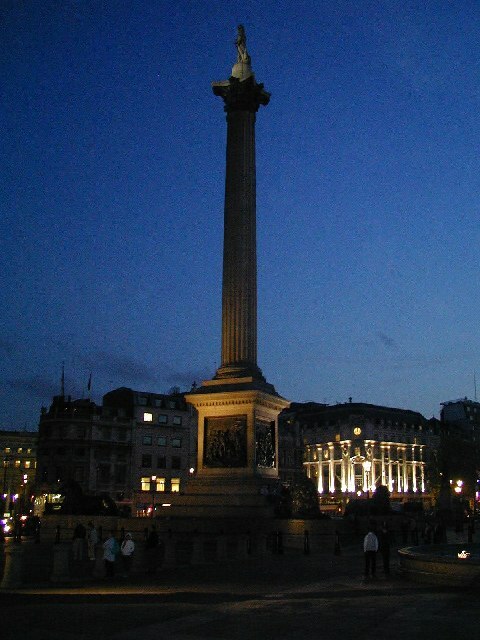 Even at Trafalgar Square, where the thrum of traffic does not abate, the night time scene from the webcam conveys that ‘otherness’ of which Beaumont speaks. Perhaps, in the electrified half-light, it is the undoing of the constraints and governances of the daylight hours. Maybe, in some future night, I will walk there and discover the city’s dark secret. But it may be, that in the process of nightwalking, the ‘dark recesses’ of my psyche will collapse and I will find, instead, my own ‘shadowy, mysterious other’. If you are a nightwalker, feel free to share a little of your experience in the comments section of this post. Johnson, Samuel A Dictionary of the English Language: In Which the Words Are Deduced from their Originals, and Illustrated in Their Different Significations by Examples from the Best Writers… Vol. 2. London, 1755. 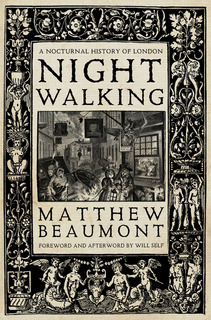 Beaumont, Matthew Nightwalking: A Nocturnal History of London Chaucer to Dickens. London: Verso, 2015. Dickens, Charles ‘Letter to John Forster’, 20 September 1846, in Hartley, Jenny (ed.) The Selected Letters of Charles Dickens. Oxford: Oxford University Press, 2012. p. 174. Dickens, Charles ‘The Uncommercial Traveller’. All the Year Round 3.57 (26 May 1860): 155-159; 3: 65 (21 July 1860): 348-352.